Nowadays, kids don’t have much use for survival skills. However, letting kids play with fire can be good — vital even — for a child’s development. When I was a child, outside was something to be nervous about. It was full of bees, spiders, dirty soil and poisonous plants. The natural environment was something to be cautious of; we were supposed to always wear shoes and stay on the path. When it rained, we ran inside and watched tv. When we were inside, the windows were always closed and the house was air-conditioned. Even though I had exposure to the woods through hikes, I was never given the opportunity to explore and master any basic survival skills and intimately learn about my environment. The reality is that we evolved for thousands of years living outside, walking barefoot on dirt floors, cooking over fires and covered by primitive shelters. Adults and children understood plants, could identify trees and wildcraft herbs for food and medicine. For thousands of years everyone, including children, carried basic tools and understood basic skills for survival such as building fires and shelters. Humans had a symbiotic relationship with the natural world where we took care of the earth and earth took care of us, it wasn’t feared, it was as real and a part of life as our homes are now. For thousands of years, children as young as 5 were treated as fully functioning and useful parts of the community. Children participated in hunting, gathering, cooking, weaving, and more. Basic survival skills were taught to children at a very young age so that all members of the community could be self-sufficient and could contribute to the whole. This means that young children were taught about fire. How to build and manage fire, how to cook over a fire, and about the controlled burning of the forest. In order to understand the basic skills of using fire, children were also taught how to use a knife. A knife, one of the most basic tools, was used for cutting sticks into bows used for fire building and hunting. Are you comfortable with your young child using knives? Are you comfortable with your young child building and stoking fire? It’s okay if you answered no. These basic skills are no longer in practice. We have ovens, heaters and food processors. Parents or restaurants do all of the cooking, children do not need to participate in the survival of the community the way they once did. But is this a good thing? When children are allowed to take risks and learn how to successfully wield once “dangerous” objects, they have a feeling of mastery. Not only does it improve the skills of focus and hand-eye coordination, it boosts the self-esteem and builds confidence, they feel useful and a part of something greater. When children are allowed to experiment with “risk-taking” behaviors such as using knives to carve wood and building primitive fires, what grows inside of them is the feeling of self-sufficiency and competence, emotional qualities that many adults lack. Children evolved with the skills of fire building and use of basic tools; they were given the room to learn about survival in order to master their environment. Danger was understood and could be safely tested, children learned about their world and developed a sense of control over themselves giving them confidence. You can provide a way for your children to learn primitive skills simply by taking them into the woods. Start by letting your kids be outside more with unstructured time. Let them be free to become bored enough that they will look for something to do and they will gravitate towards their own interests, whether that’s climbing a tree, digging in the dirt or throwing and breaking rocks. Allow your children to experiment with once off-limit objects such as sharp sticks and dull knives. Allow them to be free to choose what they use them for as long as they are not hurting anyone. Build simple fires in the backyard or while camping and let young children safely experiment with adding sticks and logs, stoking the fire and feeling the heat and intensity. Teach yourself how to wield knives and build primitive fires and then let your children watch you cutting and sharpening sticks, building small shelters out of sticks and leaves and experimenting with bow drill fires. Remember that these were basic survival skills that everyone understood and they are not as complicated as you may think. Look in your community for wilderness schools that teach adults and children and let it be a part of their summer experience. 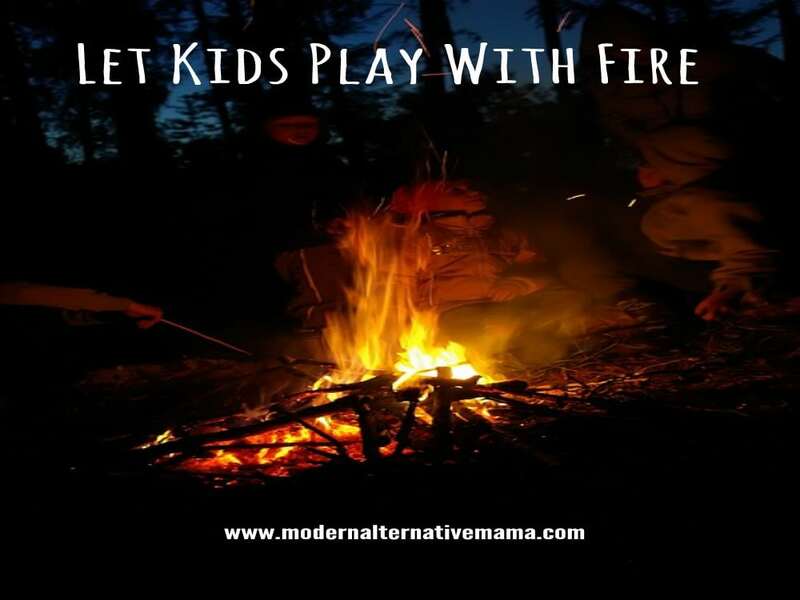 What are some ways that you let your kids play with fire, or experiment with survival skills? Ann Tepperman has dedicated her life to raising the consciousness of others through her holistic psychotherapy practice and personal essays. She lives, loves, writes, parents and meditates in Eugene, Oregon. Learn more at www.anntepperman.com.